Meg's Food! | Herb and Garlic Spaghetti Squash - Meg's Food! 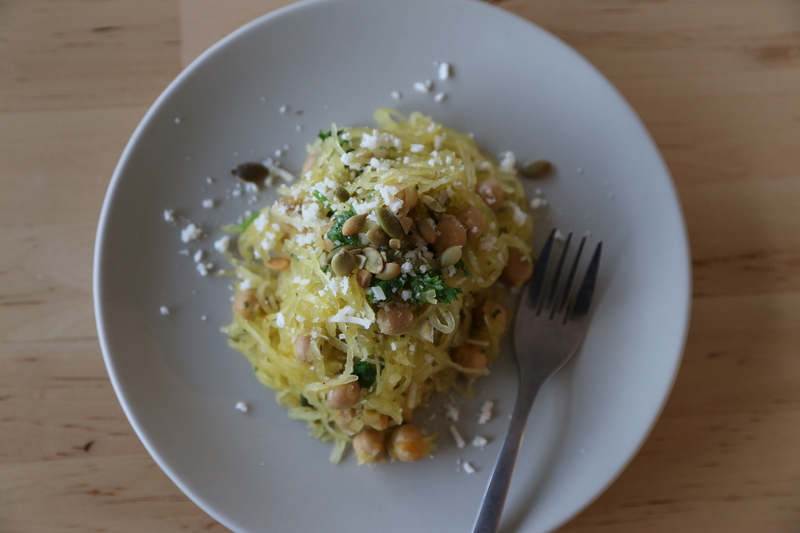 Spaghetti squash is such a fun vegetable (fruit?). It looks like any other squash, but roast it, run a fork through it, and boom, you have vegetable noodles without even getting your spiralizer or julienne peeler dirty. It can be a bit tricky to make it taste good though. The first few times I made spaghetti squash I drowned it in the same amount of sauce I’d use for any other noodle dish, and it was soggy and limp, swimming in sauce, and just not so good. I soon discovered, though, that the secret to spaghetti squash is to roast it until it’s ‘al dente’ (so not quite as soft as you normally would cook squash), and then toss it in flavour, but not sauce. Perfection! This version is super simple, but packed with flavour. 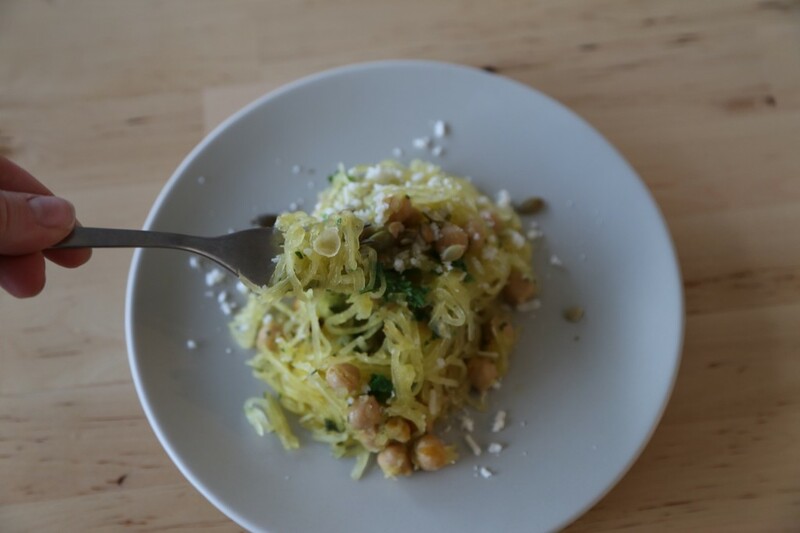 Just toss your spaghetti squash with garlic, chili flakes, fresh herbs, some sun dried tomatoes, add chickpeas for protein, and you’ve got dinner! Preheat oven to 375. 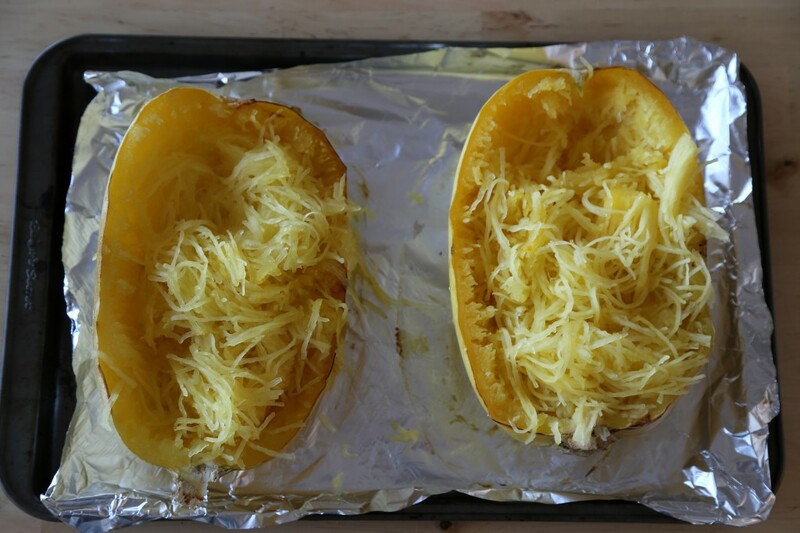 Cut spaghetti squash in half lengthwise and place cut-side down on a baking sheet lined with foil or parchment paper. Roast about 30 minutes, until tender but not super soft. Let cool 10 minutes, and then run a fork through the flesh to create spaghetti strands. Meanwhile, heat olive oil in a large skillet over medium heat. Add garlic and cook until golden, 3-5 minutes. Add chili flakes, salt, pepper, chickpeas, and sun dried tomatoes, and cook another 3-5 minutes to make sure those chickpeas soak up the flavour. Add spaghetti squash strands, parsley, and basil. Stir it all around and cook about 3 minutes, making sure all the ingredients are incorporated into the spaghetti squash strands. Serve topped with pumpkin seeds and grated Romano. 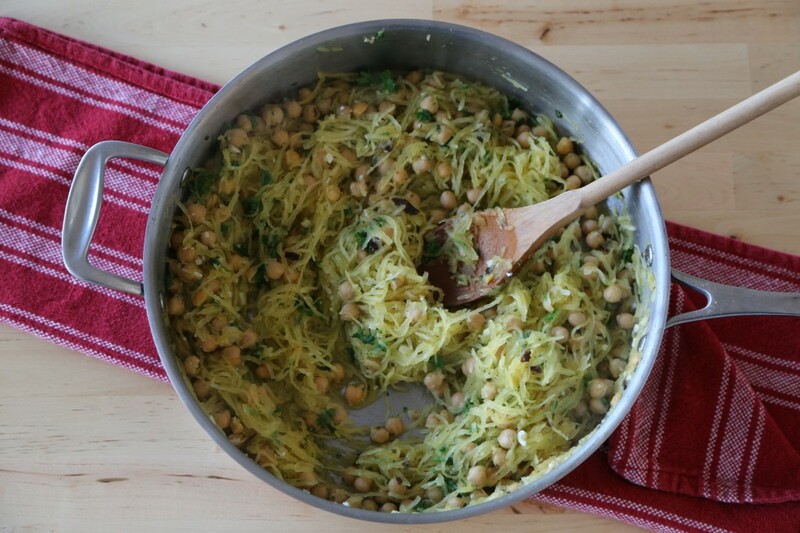 This easy, light, and flavourful take on spaghetti squash is the perfect midweek dinner! This entry was posted in Dinner, Lunch, Recipes and tagged basil, chili, gluten free, parsley, spaghetti squash, squash. Bookmark the permalink.